If you were expecting a demo for the PC version of Ubisoft's Driver: San Francisco, you can forget about it - and the game's been delayed, too. Remember back in late July when Ubisoft justified the presence of "always-on" DRM in the PC version of Driver: San Francisco in part because of the fact that it was launching simultaneously alongside the 360 and PS3 versions? I guess this was supposed to be a big thing because Ubisoft typically holds back PC releases until the console versions have made their money due to the rampant piracy on the platform. That doesn't really matter now, though, because Ubisoft has revealed, in kind of last-minute fashion, that the PC version has been pushed back anyway. And if you were hoping to get a taste of it before deciding whether or not to plunk down your money, you can forget about that too. 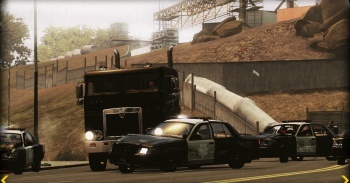 Driver: San Francisco demos hit the Xbox 360 and PlayStation 3 yesterday, but PC owners will have to settle for confirmation from Ubisoft that those are the only demos planned. The PlayStation 3, Xbox 360 and Wii versions of Driver: San Francisco are still on schedule for a September 6 release in North America, while the PC version is now slated for September 27. An OS X version is also planned but no release date has been announced.